Police have deployed tear gas and water cannon against several thousand protesters gathered in the streets of the Turkish city of Diyarbakir to condemn security operations against Kurdish militants, Reuters reports. The massive protest in Turkey’s southeast coincided with a conference at which Selahattin Demirtas, the co-leader of the pro-Kurdish Peoples' Democratic Party (HDP), urged public "resistance" against the operations. Diyarbakir Province is a stronghold of the Turkish Kurds. 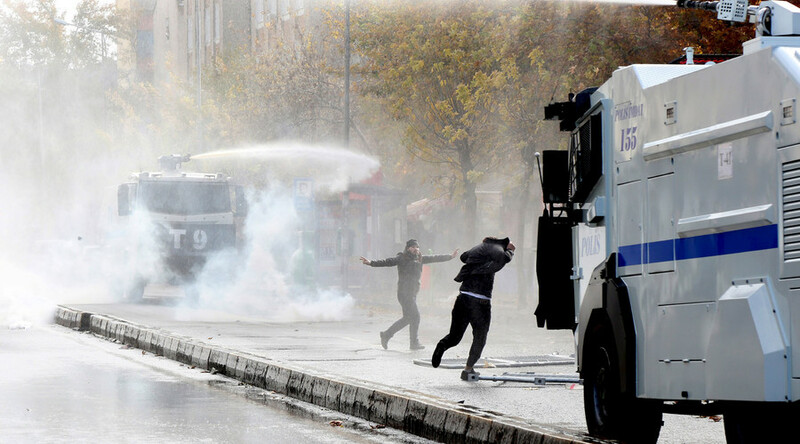 The city of Diyarbakir has been repeatedly flooded by anti-government protests. The latest was held on Monday, when people rallied against round-the-clock curfews being imposed in the region. At least seven Kurds were killed following clashes with Turkish security forces. Dozens of Kurds have been killed in recent months following clashes with police in the province. Earlier, the Human Rights Foundation of Turkey reported of a total of 52 curfews imposed since mid-August across seven provinces in the region, affecting areas where some 1.3 million people live. On Thursday, reports emerged that the Turkish Army had sent military vehicles, including tanks, into civilian areas in its predominantly-Kurdish southeast. The Peoples’ Democratic Party (HDP) has been publishing photos of what it says is a fresh raid by the Turkish Army ever since the incursion began.